Children love to imitate what their parents do! Make oral care a family activity, so kids feel included and understand that this is a daily routine – no if’s, and’s, or but’s about it! 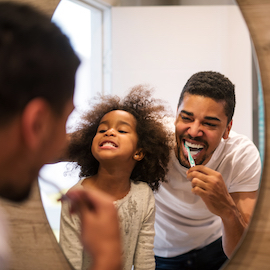 If your child is too young to brush on their own, have them stand in front of a mirror and watch as you brush their teeth for them. Try to stand behind them so they can see their mouths as the toothbrush moves around; point out where and how you’re brushing and talk your way through proper flossing so they can see and hear how to brush and floss. If they’re old enough to brush on their own, brush alongside them in the mornings, and brush and floss next to them in the evening. Soon, this will become a habit, just like it did for you when you were younger! Step 1: Angle a soft-bristled toothbrush at 45 degrees towards the gums of the upper and lower teeth. Step 2: Move the toothbrush gently in a back-and-forth motion with short strokes along the teeth and gums, both along the interior and the exterior surface. Step 3: Place the brush in an upright position to reach behind the top and bottom front teeth. Step 1: Hold a short length of floss between the thumb and index finger, wrapping it around one finger at each end to gain better control. Be careful not to apply too much pressure. Step 2: Adjust the floss into a ‘C’ shape curve around each tooth and slide it up and down gently along the side of the tooth and under the gumline. Avoid Chewing on Ice, etc. Kids love to chew on things – from pacifiers to teething rings to their thumbs or other fingers – this can push their teeth out of place. It’s recommended to break these habits by the time your child turns 4 to prevent long-term damage. Discourage your kids from chewing and sucking on ice and hard candies, as well, which can break teeth or reduce their stability. Another important part of your child’s oral health habit is coming in to see us. Be sure to bring your child in for regular cleanings and checkups every six months. We’ll be able to examine your child’s teeth and see if their oral health routine is effective. Call us today to schedule appointments for your entire family!